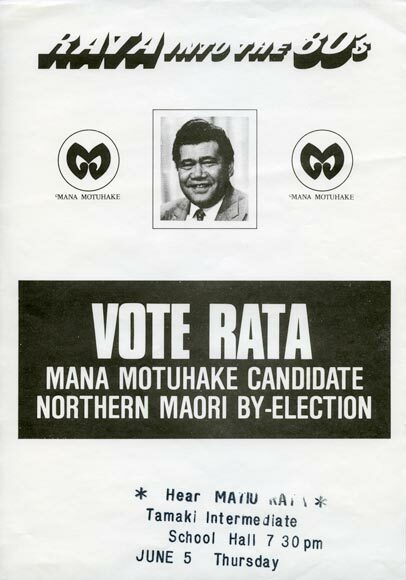 This 1980 campaign flyer announces a public meeting by Matiu Rata, then the Mana Motuhake candidate for the Northern Māori seat. Rata first became MP for Northern Māori, representing the Labour Party, in 1963. He held the seat until 1979 when he resigned from the Labour Party, and later from Parliament. At the following election in 1980 he contested Northern Māori for Mana Motuhake, but lost to Labour candidate Bruce Gregory.